In a physical store, you can see your customers come and go. You can talk to them face to face and help them find what they are looking for. In other words, you have direct contact with them. An online store is different. You do not see your customers. You might not even know they visited your store. However, this does not mean that there are no other ways for online sellers to know their customers and serve them better. Website analytics has been one such way through which you can get insights as to what is happening on your online store. As a matter of fact, running your ecommerce store without analytics is just like driving a car in heavy rain without wipers. You are basically blind and are unaware how your website is doing. However, with the right use of analytics, you can easily find out what is working on your website, who are your customers, from where they are coming, and what they are interested in. 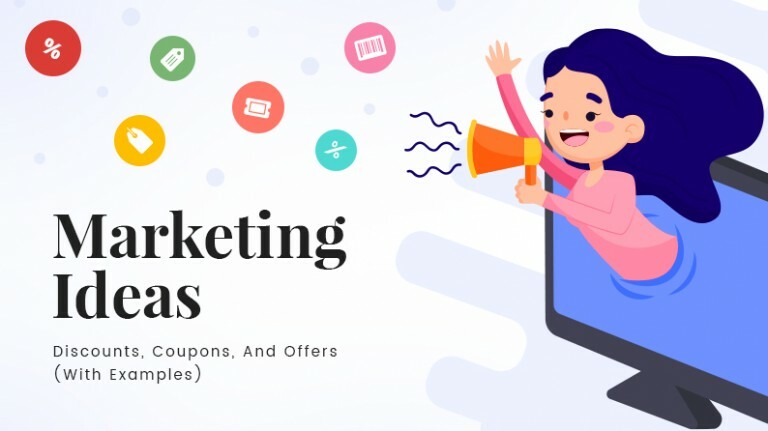 Given the constantly changing customer behavior & market dynamics, collecting all this data becomes important in order to make better decisions concerning marketing strategy of your store,as well as to serve your customers better. In early days, a simple basket analysis used to aid ecommerce marketplace owners in making recommendations to customers. 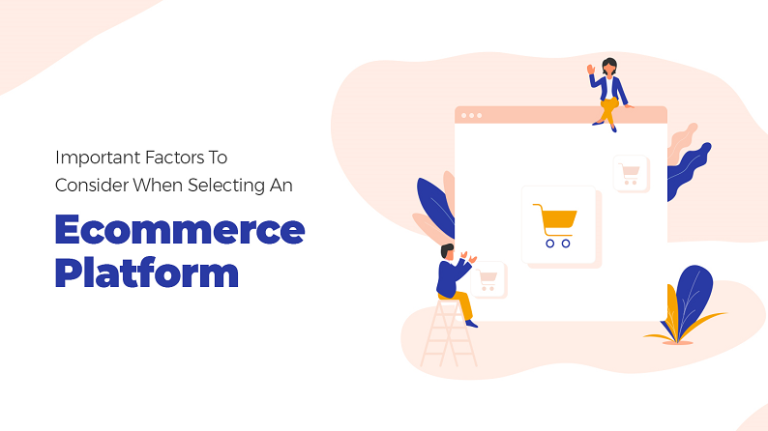 Now predictive algorithms based on advanced concepts like machine learning are being used to ensure that those recommendations are more valid and are being accepted by target customer. Color psychology is being used to ensure optimal conversion. Special focus is being laid on graphics and display of information so that the overall process of making a purchase is made seamless. 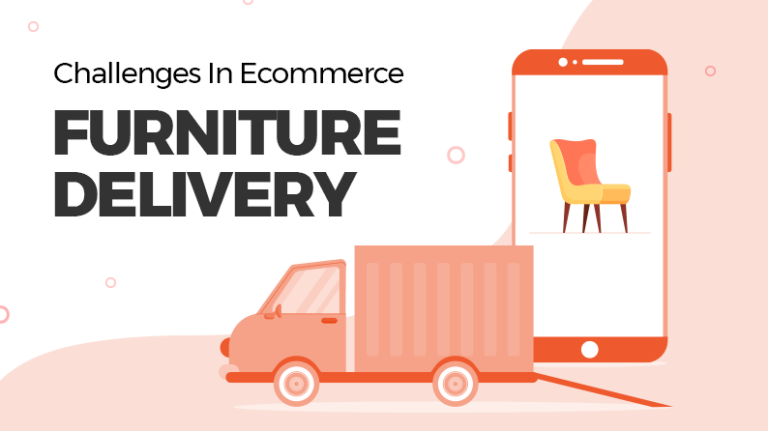 E-wallets have become a core part of any ecommerce marketplace. They not only help in aiding secure payment architecture but also make the overall payment process streamlined. Why Should You Bother with Analytics? Example 1: Consider you have an online store that sells T-Shirts. In order to attract consumers, you advertise on several platforms. Soon after, your website starts to get some traffic. 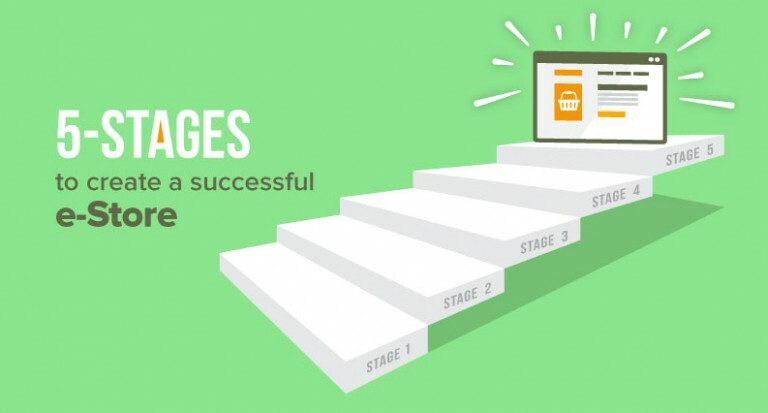 Now you want to make this process efficient, by only focusing on those platforms from where you are getting bulk of your traffic. This is where analytics come into the picture. Example 2: Lets’ assume that you have an online electronics store selling a multitude of products across several categories. Some of your products are selling like hotcakes, while others are not doing so great. In order to ensure that your marketplace is as efficient as possible, you need to delve into the data and the best way forward is using analytics. There can be numerous other scenarios, when presence of analytics is not just helpful but also necessary. It is only after considering these scenarios where analytics can be useful that the analytics tool for Yo!Kart was designed. 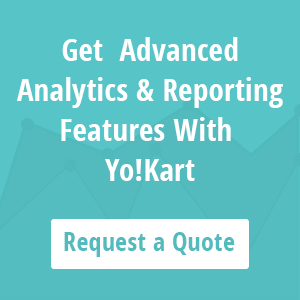 Below we will discuss some of the key aspects of an analytics tool and how Yo!Kart analytics is designed to cover these crucial areas effectively. 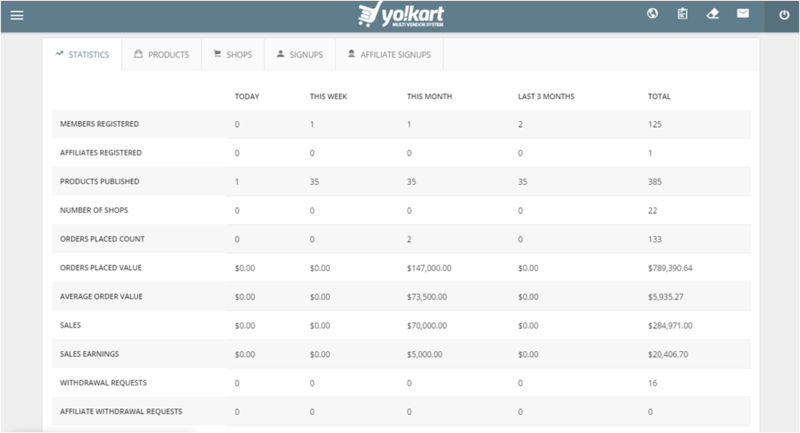 Each aspect of analytics and report regeneration for Yo!Kart was built by taking cues from Google analytics. Here are some of the ways in which analytics in Yo!Kart can yield high value. For some, analytics can often become perplexing. For this reason, the dashboard of Yo!Kart displays all the key reporting in a nice graphical manner. This has been done to ensure that admin gets a clear view of all the key aspects of his/her marketplace. This includes new visitors, total sales, new vendors, earnings, and more. For a marketplace, these metrics are critical in ensuring sustained growth. For a marketplace owner, number of visitors coming to website is an essential data. It lets you analyze how popular is your website. When you are running a physical store, you can analyze its popularity by looking at the number of people coming to your store(footfall). However, for online marketplace owner, the only way to determine the same is to look at visitor analytics. 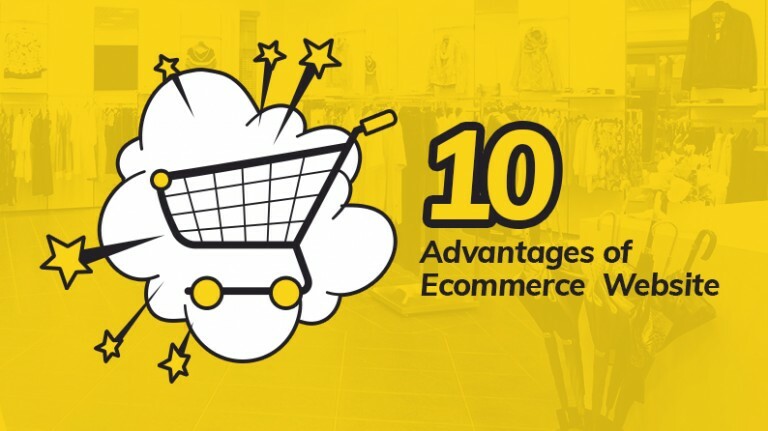 The key difference between a storefront and online marketplace is that the former gets mostly local visitors while latter can get a visitor from anywhere. To find out from where visitors are coming to a marketplace, you can access traffic report. It highlights all the sources and referrers including social media website as well as search terms. In addition to that, you can also find out the country from where the visitors are coming. This will certainly assist you in formulating a better digital marketing strategy. If a visitor comes to your store but goes out without buying anything, it becomes a worry for your business. As a business, you don’t just need visitors but also customers who actually buy things. In other words, you don’t just need traffic but conversion as well. When same thing happens on an online marketplace,it becomes quite difficult to find out where you lose the customer. Yo!Kart analytics tool has that covered with its conversion report, where you get a detailed analysis of how many users added a product to cart, reached checkout, canceled or ended up making a purchase. This data in turn allows you to alter your strategy to ensure that you do not lose many visitors. Other than above-mentioned analytics, Yo!Kart also offers a detailed view of each and every aspect of your marketplace in its reporting. This includes sales, products, shops, affiliates, sign ups, etc. Meaning, you do not need any external analytics service like Google to monitor your website. 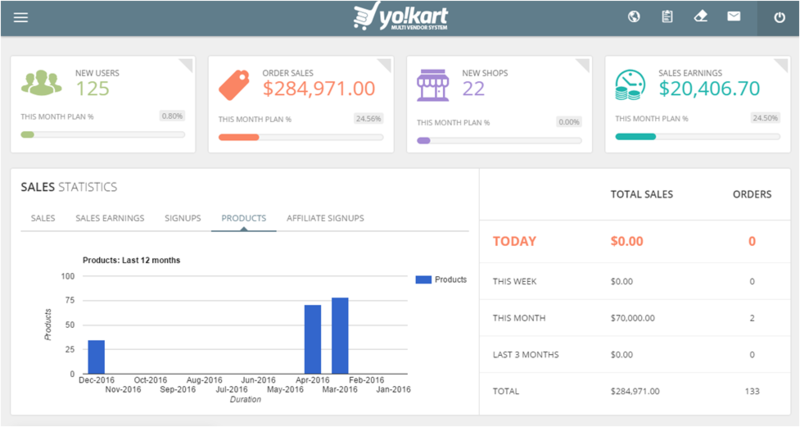 With Yo!Kart analytics, you get a detailed overview of the website right in the admin dashboard. As the old saying goes ‘knowledge is power’; when you are running a business, data is your power. The analytics tool provides you with that power & enables you to make more informed decisions and produce the best possible results for your ecommerce store. 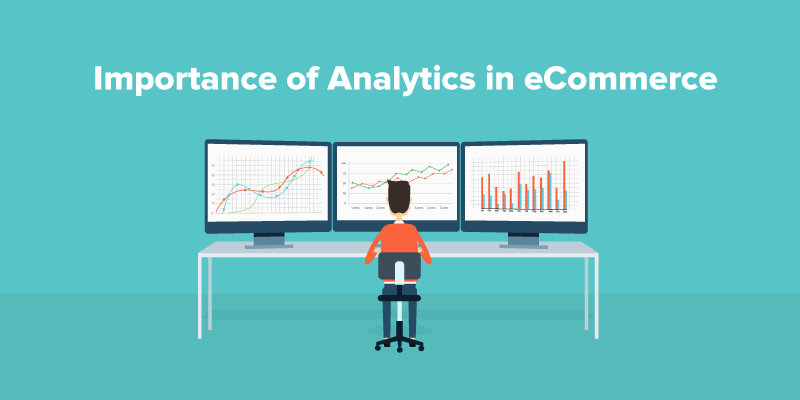 So it becomes crucial that ecommerce platforms, whether they are for single stores or marketplace solution, offer built-in analytics. 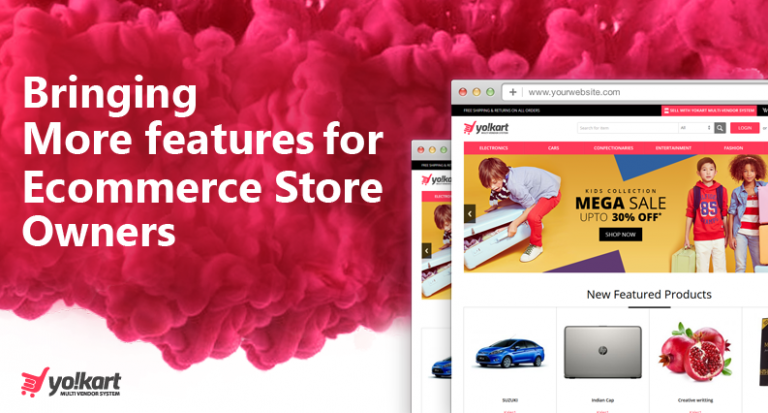 Yo!Kart in that sense offers a powerful and complete package to entrepreneurs looking to launch a new ecommerce startup. I agree with you. Now a days analytics is most important part for any business to update with new trends in markets and the new technology’s. Knowing your website visitors and theie behaviour is the key to convert them to loyal customers. Using Analytics is the way to do it. whoah! this blog is great i love reading your posts. Keep up the great work! You know, a lot of people are looking around for this information, you can aid them greatly.